Probably one of the easiest commodities to learn how to inspect is Strawberries. Although there are a few defects that are commonly found, most are easy to identify. Except one. By far the most common defect found while inspecting strawberries is bruising; and it is easily the most misidentified. Way too many inspectors, whether they are USDA inspectors or company’s own quality assurance inspectors, confuse bruised strawberries with decayed strawberries. They almost always error on identifying it as decay, when it is really bruising. Take a look at the image above. The area on this strawberry is definitely indented or sunken, no evidence of mold, nor does it appear to be soft or mushy. This is a bruise. No doubt about it. The only question; is the bruised area large enough to be considered a defect? The USDA inspection instructions state the bruise must exceed 1/2 inch in area on a strawberry 1-1/2 inches in diameter. 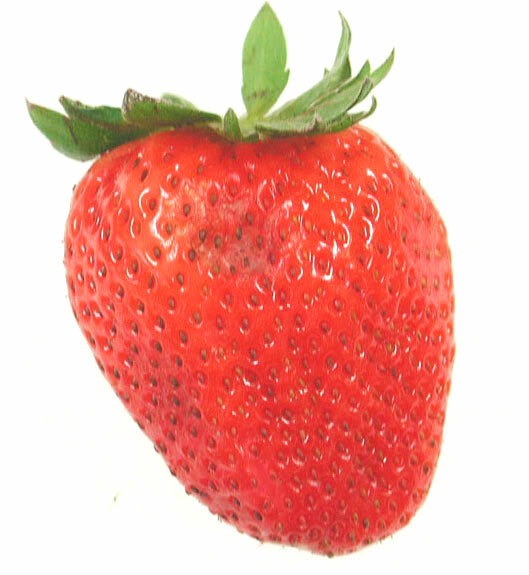 If you score the strawberry as a defect, it counts against the 10% tolerance for total defects. But now the confusion begins. While inspecting you come across this strawberry, as shown above. You can definitely see the sunken area, still no evidence of mold, and it appears to be soft and mushy. The USDA inspection instructions tell us to score any soft or mushy areas as serious damage by bruising (no matter what size of area is affected). But is it decay? Many inspectors will quickly call this type of defect decay, simply because it is soft and mushy and may be leaking strawberry juice all over your hands. They may be incorrect. To be certain you must touch the soft area with your finger and determine if the soft or decayed tissue scoops out. If so, then it is decay. Also if you take some of the soft or decayed tissue and rub it between your fingers, if it is decay the tissue will disintegrate. Is it confusing, especially to a new inspector? Absolutely. Blue Mold Rot is a very common decay found in strawberries but in early stages you will not see any mold growth. 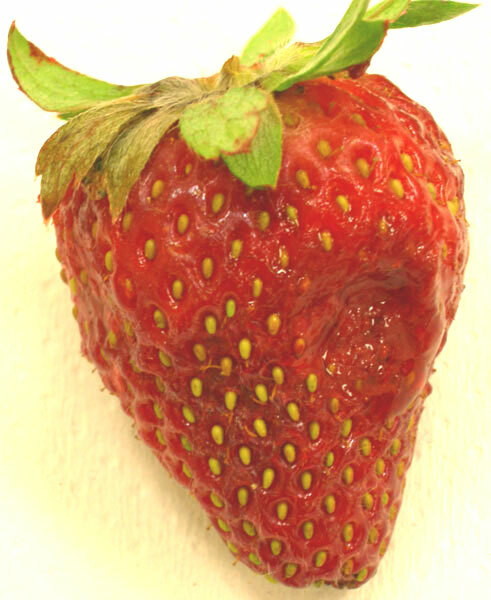 Typical of Blue Mold Rot the decayed tissue will scoop out, leaving a cavity on the side of the strawberry. My advice, take your time when inspecting strawberries, and don’t be too quick to jump on calling bruised berries decayed berries.